As a child, I studied at the Collège Sainte-Elisabeth, rue de Lourmel in the 15th arrondissement of Paris. By an odd coincidence, not only I, but two other students - Ghislaine Thesmar and a young girl whose name I have forgotten - all became dancers at the Opera! Initially what attracted me to dancing were the costumes, putting on a disguise. My father – rather more seriously, as one might imagine – wanted to know whether I really had what it takes to dance. Born in the Piemont, he was the rational sort! Accordingly, aged ten, I was presented to Monsieur Aveline, who examined me, found me flexible enough, and told my father that the Opera School would take me. The year was 1948, and the criteria, much less strict than they are today! My real name is Bassi. I changed it once I was appointed première danseuse, because someone with the same initials had got there before me - Claude Bessy! My father marched me off to Mlle Zambelli at the Studio Chaptal, hoping that I might catch up. The first thing I remember about class with Mlle Zambelli was her strangely low voice. As I was on the tall side, she plunked me down in a class with older children – but in the very last row. As one improved, one moved up a row, until one reached the first! That was how things were done in those days. But I do regret that she never saw fit to put me in with pupils of my own age, because there remained gaps in my training, and I did notice how very carefully she worked on placement and turnout with the two or three younger children she had agreed to teach. Three times a week for ten years, in addition to my classes at the Opera School, I would walk up to Chaptal to study under Mlle Zambelli. By the time our studies drew to an end, only three or four pupils were left, one being Claire Motte. At the Opera itself, Mlle Zambelli taught the Grands Sujets, who were all expected to wear a tutu, while she taught in long petticoats. Accompanied by her parents, Mlle Zambelli had emigrated to France at the age of sixteen, and had always lived rue Chauveau-Lagarde in the 8th arrondissement; a "blue plaque" has been put up on the building in her honour. In my day, near the Opera, there were few shops - it was Theatreland then! The very buildings where the C & A or Lafayette Maison now trade were blocks of flats, where most of the dancers lived. Mlle Zambelli rarely changed the barre, that was short, simple, and very straightforward. It lasted about twenty minutes. Definitely not a "choreographed" barre. 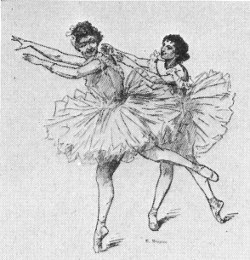 She taught the so-called Cecchetti fifth (front foot closing against the big toe joint of the other, rather than both feet fully crossed – editor’s note). I recall that in the upper classes, amongst the very first barre exercises was grand rond de jambe jeté depuis la seconde – that was how things were done then! Frappés were done with the accent inwards, and battements with the accent downwards. In the middle, every pose was épaulé. She would start with battement dégagé exercises, then a rather elaborate adage (she used to say "here is the adage that Monsieur So-and-So would give…" - how I regret that I can no longer recall their names! - then pirouettes and grandes pirouettes. Then came the small jumps, small and large ballonnés, batterie and so forth, ending with the big jumps. And now for the notorious séries, one or two of which we would do every week. Very well thought-out, these séries gave us great strength and stamina. As little children, we began with simple séries: jetés, then assemblés, then sissonnes, then ballonnés in every possible variant and configuration, and always moving downstage, upstage, and for the more advanced pupils, en tournant. But do not let anyone tell you that Mlle Zambelli’s class was just a load of séries! The pianists did not always turn up for class, because the pay was dreadful, in which case; Mlle Zambelli would count, and very exactly. As a young child, I learnt all the time signatures, and it proved most useful – notably when I was teaching the fifth division of boys at the School, sometimes without a pianist! At the end of the class, she would have us do mime exercises, as well as scenes from ballets and entire variations. When we were little, she would have us dance excerpts. Mlle Zambelli strongly objected to high legs: "You are sliding down the slippery slope to gymnastics" she would shout, "and as for the gymnasts, they’d like to be dancers!" She would push us to break out of our reserve, force us to be theatrically alive, to learn pantomime scenes, or in my case, because I was timid, to dance on highly dramatic music. 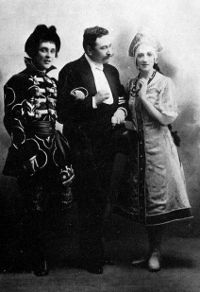 When Mlle Zambelli was invited to Saint Petersburg early in the 20th Century, the Theatre was so taken with her dancing that they begged her to fill the contract out with whatever figures she pleased! But Mlle Zambelli, whose family was quite wealthy, was not motivated by money. The studio belonged to her, and she taught because she enjoyed it. Dancing was not a business to her. My father being Italian, she refused flat-out to take a penny for teaching me. Out of gratitude, my father would give her some small gift, or invite her over for dinner. Whenever she came to dine, which was often, she would always be accompanied not only by Monsieur Aveline, but by the latter’s wife. Unlike so many others, Mlle Zambelli was a woman of great dignity and had never been a courtesan. The love of her life was Albert Aveline. At Garnier, he and Carlotta Zambelli would watch every performance from two little seats just above the staircase, at the height of the corbeille and next the stage. When Mlle Zambelli, by then a celebrated ballerina, had decided to change partners, she went and picked Monsieur Aveline out from amongst the sujets. They both died in 1968, she at Milan because her family had come to fetch her when she could no longer climb the stairs rue Chauveau-Lagarde. I went to visit her at Milan in her rather gloomy flat. Her face lighted up, and she began to chat with great vivacity. At the Opera School, I worked for three years under Mlle Simoni, and then under Lucienne Lamballe when I was thirteen. She was a harsh taskmaster. If a pupil’s attention wandered, she might give us an hour, I repeat an hour’s ronds de jambe, or punish us by having us stand for one hour in fifth. That being said, insofar as solid technique was concerned, Mlle Lamballe was excellent. Another of my teachers was Camille Bos. She used the most speaking images, like "your hands are like washcloths" and I’ve never forgotten them! Then there was Geneviève Guillot, who became head of the school at one point, Suzanne Lorcia who had been a student of Zambelli too and had the most delightful sense of humour, and Harald Lander when I became Grand Sujet. What distinguished Mlle Zambelli from everyone else is that she was a grande dame. In a way, for me, she was maître de ballet too, because she would rehearse me in my roles. Her eye was keen ! With her, there were no shortcuts – and no cutting short a lesson either. My husband Attilio Labis studied with her, as did Pierre Lacotte, Serge Golovine, Michel Dussaigne, Jacques Touronde, Daniel Franck… they were to kiss her hand. The men took class along with the girls. When the time of year for the examen came round (now called the Concours – editor’s note), Mlle Zambelli would watch the dress rehearsal, and then come up to give us the most valuable advice. Christiane Vlassi was Première danseuse étoile of the Opera. After a brilliant career, she was appointed professor at the Opera School, and international guest teacher.